OPPO’s upcoming F series smartphone, the OPPO F11 Pro, has been the subject of a number of leaks and reports lately. Just last month, the phone was certified by three regulatory authorities across the globe under the model number CPH1969. 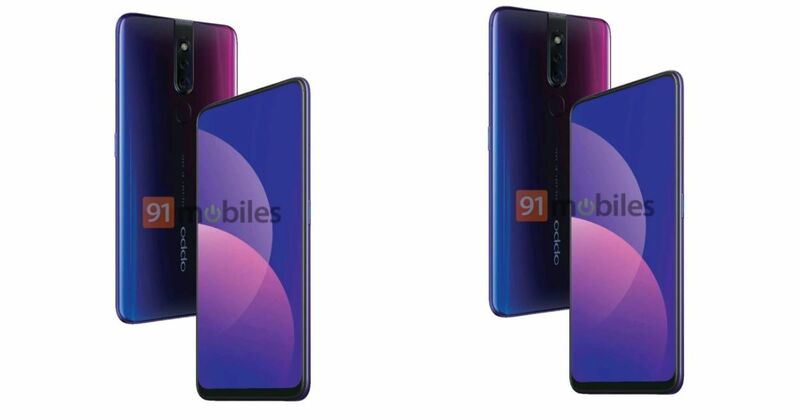 Now ahead of the official unveiling, 91mobiles brings you the first official press render of the OPPO F11 Pro, apart from revealing its key specifications as well as the phone’s India launch timeframe, from sources in OPPO’s distribution channel. Talking about the design first, as seen in the render, the OPPO F11 Pro sports an all-screen fascia with minimal bezels on all the sides. The phone’s earpiece is embedded inside the top bezel. At the rear, the smartphone flaunts a dual primary camera setup with an LED flash, which is placed in a single strip that connects to the top of the back. Below the cameras, there’s an oval-shaped fingerprint sensor. The smartphone will be available in a gradient hue, but we can expect more colour models for the handset as well. As far as the specifications are concerned, the OPPO F11 Pro boasts of a primary CMOS camera that sports a 48MP sensor. Our source suggests that similar to the Xiaomi Redmi Note 7 Pro, the F11 Pro will also capture photos in 12MP resolution, and will utilise pixel binning technology to shoot 48MP images. Notably, the same sensor is expected to be available on the upcoming Vivo V15 Pro. For selfies, the smartphone is equipped with a 32MP pop-up camera. Furthermore, we’ve learned that the F11 Pro packs in a high-end MediaTek SoC, 6GB of RAM, and 128GB of storage. According to our source, OPPO is planning to launch the F11 Pro at some point in the first week of March. While we don’t have details regarding the handset’s exact pricing, we expect it to be available under Rs 25,000.